Welcome to another installment of the TRASH BIN, where we watch the worst movies Hollywood has to offer, according to the critics, and give you our thoughts, good or bad. This week's pick is the 2017 horror flick...DON'T KNOCK TWICE. Few genres are as rife with subjectivity and appeal to as diverse an audience as horror. Horror plays on humanity’s basest instincts, a hit-and-miss criteria that can fail or succeed on minor successes or missteps. This past week, I experienced a new independent horror film starring Katee Sackhoff (primarily known for playing Starbuck on the mid-2000’s sci-fi TV show, Battlestar Galactica) and Lucy Boynton (breakout star of last year’s Sing Street). This limited-release, low-budget paranormal horror film, Don’t Knock Twice, is currently at a 36% on Rotten Tomatoes, averaging a 5.6/10 rating. Don’t Knock Twice does not deserve to be sitting in the Trash Bin. 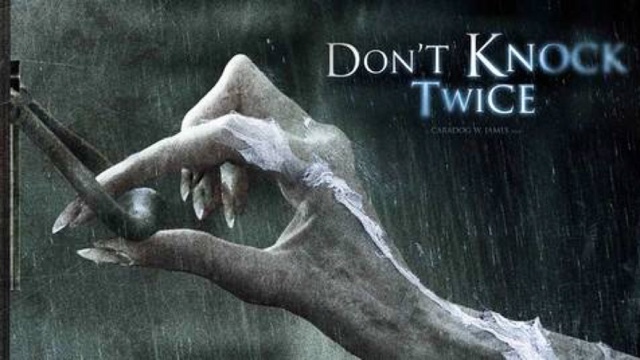 Don’t Knock Twice follows two lead characters -- a mother and her estranged daughter -- as they attempt to reconnect and trust each other again. At its heart, this film is about family and protecting those you love at all costs. Chloe (played by Lucy Boynton) claims that her life is endangered by a supernatural presence that has already taken the lives of her friend and her boyfriend. Out of options and afraid for her life, Chloe goes to live with her recovering addict and neurotic artist mother, Jess (Sackhoff). No one is sure whether or not Chloe is lying, insane, or something more insidious. As the story progresses, mother and daughter are forced to trust one another and put aside their past together. There are notable issues with Don’t Knock Twice that disrupt its effectivity and flow. Primarily, the greatest weakness of this film lies in Katee Sackhoff’s ability to match Lucy Boynton’s performance. After Sing Street, it became evident that Boynton was well on her way to becoming an established acting force that seems destined for a successful career. While Boynton brings a level of chaotic emotion and naivete to her role, Sackhoff comes across as either unfeeling or melodramatic in almost every scene. For fellow fans of Battlestar, this is a bit sad to see, since Sackhoff has shown much more developed acting chops in other roles in the past. Narratively speaking, there are some glaring moments of plot convenience and horror movie tropes that come across as flat and unconvincing. In the end, this is obviously a low-budget horror movie that could have benefitted from a slightly more refined script. So, why, with all those negatives out on the table, is Don’t Knock Twice a worthy watch? First of all, as previously stated, Lucy Boynton shines in her role. Although she runs the risk of being typecast moving forward, Boynton brings a quiet maturity to young adult roles that is reminiscent of what Taissa Farmiga was able to accomplish on American Horror Story. Although she has her fair share of acting flaws and occasionally errs on the side of overacting, Boynton delivers a performance here that I never doubted. The slow burn of Don’t Knock Twice is handled shockingly well. The greatest weakness of most independent horror falls squarely on not knowing how to tell a subtle story. Don’t Knock Twice successfully pulls off a surprising story with a creative ending that shows much more than it tells. In the end, I appreciated the storytelling skill of this movie much more than some critically-lauded horror films of last year like Don’t Breathe or Lights Out. It could be argued that the quiet style of this movie detracted from its scariness. But, in the end, I would much rather have a less-scary horror film with well-executed dramatic tension than a purely terror-driven film without actual emotional stakes. Don’t Knock Twice will not go down in the annals of 2017 as one of the year’s best horror films. It will probably not remain in my Top 10 of the Year much longer than May or June. However, it is definitely worth a VOD rental in the comfort of your living room. In a world where horror tends to either be amazing or awful, it’s fun to watch a horror movie that doesn’t try to be a masterpiece, but merely succeeds at what it sets out to do. See it.